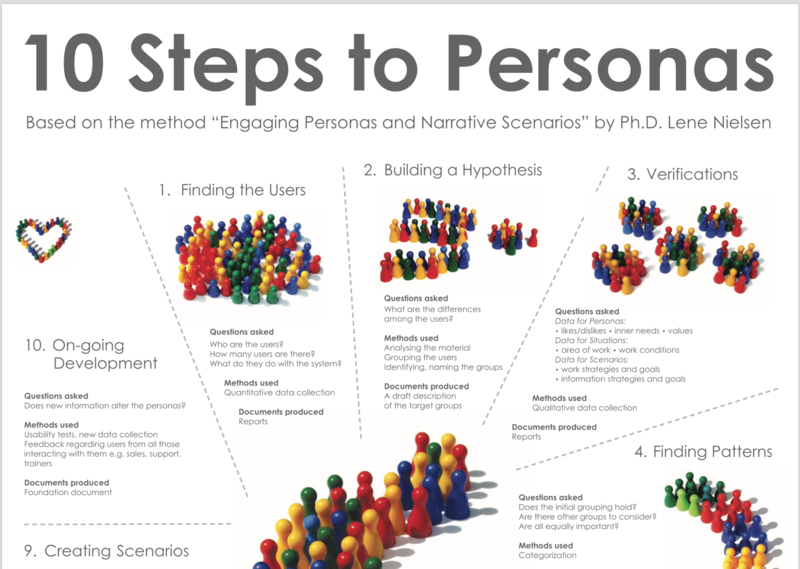 Lene Nielsen, who specializes in Personas has developed a “10 Steps to Personas” methodology. Below is an excerpt from her paper. Please follow the source link to read further, it’s worth to read. “The persona method has developed from being a method for IT system development to being used in many other contexts, including development of products, marketing, planning of communication, and service design. Despite the fact that the method has existed since the late 1990s, there is still no clear definition of what the method encompasses. Common understanding is that the persona is a description of a fictitious person, but whether this description is based on assumptions or data is not clear, and opinions also differ on what the persona description should cover. Furthermore, there is no agreement on the benefits of the method in the design process; the benefits are seen as ranging from increasing the focus on users and their needs, to being an effective communication tool, to having direct design influence, such as leading to better design decisions and defining the product’s feature set. A persona is not the same as an archetype or a person. The special aspect of a persona description is that you do not look at the entire person, but use the area of focus or domain you are working within as a lens to highlight the relevant attitudes and the specific context associated with the area of work.” source.